All rabbit food should be fed with high quality straw and hay, to provide your rabbit with essential fibre to reduce the risk of hairballs and blockages caused by a lack of digestible and indigestible fibre. Hay and straw should form most of your rabbit's food and will help wear down their teeth which constantly grow, if teeth are allowed to overgrow they can cause many health problems and costly trips to the vet with your rabbit! Rabbits require a diet that is made up of three parts, hay, vegetables and a nutritionally balanced complete rabbit food, such as a muesli mix or extruded rabbit pellet that contain all the beneficial vitamins, minerals and fibre, that should be supplied with fresh, clean, drinking water! Feeding the right balance of these food groups, will help your rabbit maintain their immune and digestive systems, keeping them fit and healthy. A bad diet can result in overgrown or misaligned teeth, obesity and digestion problems, consequently we suggest that you always provide plenty of fibre and suitable portions of vegetables and a dry rabbit food. As a guideline a pile of hay approximately the same size of your rabbit should be available for them to eat, each day, but some rabbits may eat more or less than this amount. If your rabbit is fussy and eats only small quantities of hay, you can encourage them by placing the hay in areas they like to sleep or stuff rabbit toys such as cardboard tunnels with hay to encourage them to nibble away! 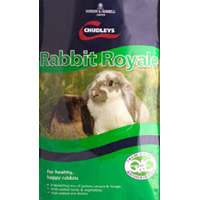 We stock a wide range of rabbit food brands from the leading manufacturers; Supreme Russel Rabbit, Burgess Supa Rabbit, Chudleys Rabbit Royale & Spillers Rabbit Pellets & Muesli. There are two main types of rabbit food; extruded pellets that contain all the ingredients compressed into bite sizes pieces and mixes that contain all the essential fibre, minerals and vitamins in a selection of different ingredients, for example cereals and flaked peas for your rabbit to nibble on! If your rabbit is guilty of selectively eating the bits of a rabbit food or muesli mix they like, we advise trying a complete extruded rabbit food or pellet that will help avoid your rabbit missing out on vital nutrition! Why not try a rabbit food like Burgess Supa Rabbit Excel, Supreme Science Selective or Chudleys Rabbit Pellets that will be more suitable for a selective feeder than a complete rabbit food or muesli? Adult rabbits, regardless of breed should be fed a rabbit food with a fibre content of atleast 18 to 20% to help digestion and a protein level of 12 to 14%, but young adolescent rabbits that are growing will require a food with a higher protein level of approximately 16% until they reach maturity. Please note if you intend to change your rabbit food, we suggest you gradually mix the new food with your existing variety over a period of 7 to 14 days, to avoid upset stomachs! Regardless of the brand or size you choose, all the rabbit food varieties featured on this webpage are Vat Free and available in economical bulk bags rather than expensive small bags, sold in most small pet shops or garden centres to encourage you to shop more frequently, saving you time and money feeding and caring for your rabbit. Rabbit Food: 5 stars out of 5 based on 3 user reviews. I recently ordered two bags of chudley rabbit royale. My order was easy to place and came very quickly. Your prices are also very competitive. I will definitely be using your service again.